The alternate clay forms a new class of materials which can be obtained by a homogeneous distribution of pores and open pores ranging from 4 to 18 Å. This allows the adsorption of molecules ranging in various sizes. 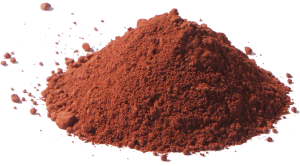 There are reports in the literature on previous physical treatment in natural clays aimed at enriching the sample in the clay fraction to a more effective result in the adsorption of interlayer solution.